With their quirky colour schemes, cosy dimensions and heart warming appeal, beach huts are well and truly an icon of the Great British seaside! Whether your grandparents had one when you were young, you and your family enjoy days at the beach in one of your own or you’ve always hankered after one, beach huts conjure up thoughts and images of the fresh sea air and gently rolling waves. The Beach Hut day invitation from Bride & Groom Direct is sure to excite all beach dwellers thanks to its rustic charm, quirky design and natural colours. The rustic wooden background is perfectly reminiscent of a faithful wooden friend that has borne the brunt of the salty sea air, to become a well-worn member of the family. 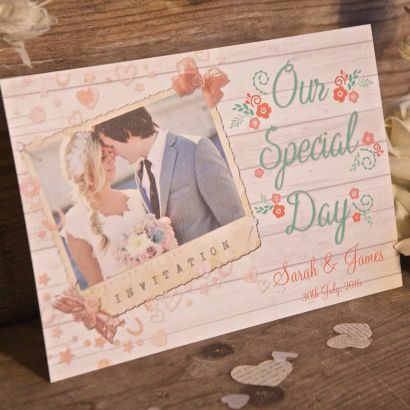 A well chosen picture of the happy couple takes centre stage in this delightful design, whilst the words ‘Our Special Day’ instantly allude to your upcoming wedding! Beautiful hearts, stars and flowers adorn the left hand side of this invitation, adding embellishment and style, whilst the Bride and Groom’s names, along with your chosen wedding date, are perfectly placed in the bottom right hand corner. Turn the page and you’ll be greeted by your very own choice of wording, displaying the wedding day information and anything else you’d like to include, i.e. RSVP details and your wedding colour theme. All of the wording in this lovely invitation is completely customisable, even down to the font, size and colour! So if you’re planning a beach inspired shindig, or you’re actually preparing to say ‘I do’ on the sandy shores, the Beach Hut invitation is sure to set the scene perfectly!